are relying heavily on the eastern states' gas prices rising. Chief financial officer Andrew Seaton said the company was very comfortable internally that gas prices would rise to its publicly stated forecast of between $6 and $9 a gigajoule beyond 2015 when three big liquefied natural gas projects in Gladstone start sucking up most of the east coast's gas. "We use a gas price towards the upper end of that range," Mr Seaton said. "We're seeing evidence in the market already that prices are being signed in that range." The Australian recently reported Origin Energy sold miner MMG gas at a price that rises to $9 a gigajoule once the LNG plants are up and going. Neither Origin nor MMG has confirmed or denied the price. Gas prices are now between $3 and $4 a gigajoule. Santos said 2012 net profit fell about a third due to an absence of assets sales that boosted the previous year's result. Net profit fell 31 per cent to $519 million but underlying profit, which excludes one-off gains and losses, rose 34 per cent to $606m. The underlying figure beat the $586m average of eight analysts' forecasts compiled by Dow Jones Newswires. Underlying earnings were lifted by two natural gas projects coming online in Indonesia and Western Australia, accelerating a shift by Santos away from oil production as a key driver of earnings. Santos is also a major shareholder in two multi-billion-dollar gas-export projects in Papua New Guinea and Australia, slated to start production in 2014 and 2015 respectively. Santos shares were up 24c, or 2 per cent, at $12.14 today. Santos said the Gladstone LNG gas-export project in Queensland, which counts Total SA and Petroliam Nasional as shareholders, is on track to ship its first cargo of LNG in 2015 and remains on its recently revised budget of $US18.5 billion. Chief executive David Knox stressed Santos would not need to raise equity to finance its share of the funding for GLNG. Mr Seaton said GLNG was not looking at selling infrastructure, moves which its two LNG rivals, BG Group and Origin Energy/ConocoPhillips, have flagged. 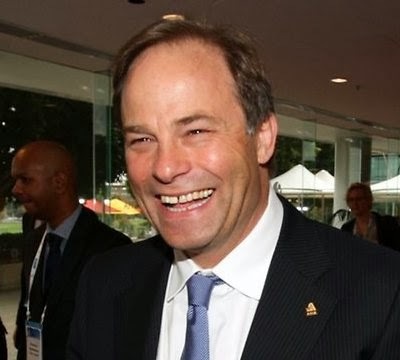 Santos said it increased its proven and probable (2P) reserves to 1.406 million barrels of oil equivalent, from 1.364 million a year earlier, representing what it said was an annual 180 per cent reserve replacement rate. But it was forced to almost halve contingent reserves at the GLNG project from 3.277 million barrels of oil equivalent to 1.638 million. "Reduction in GLNG and other Queensland coal seam gas fields (was) from a technical reassessment of recovery factors associated with deeper and/or lower permeability coals" combined with new guidelines for calculating reserves, Santos said. Mr Knox stressed the drop came from areas not earmarked to feed into the LNG plant until 2025 or later.